How did the US manage to spend $61 million on an Expo 2010 pavilion? IRS filings offer some insights. As regular readers know, for more than a year I’ve asked the USA pavilion at Expo 2010 (World’s Fair) and the State Department to provide me with a precise accounting of how they’re spending the US$61 million that they’ve raised from private corporations in the name of the United States of America. And, for more than a year, I’ve been met with either a) silence, or b) “we can’t do anything unless the pavilion’s board of directors approves it.” Even if the latter answer is sincere (and I’m pretty sure it’s not), the fact that several of the board members refuse to return my calls doesn’t bode well for my request. So, rather than bang my head against the pavilion wall, I’ve decided to take a look at what the Internal Revenue Service has on Shanghai Expo 2010, Inc (that’s the name of the non-profit corporation that funds and manages the USA pavilion). 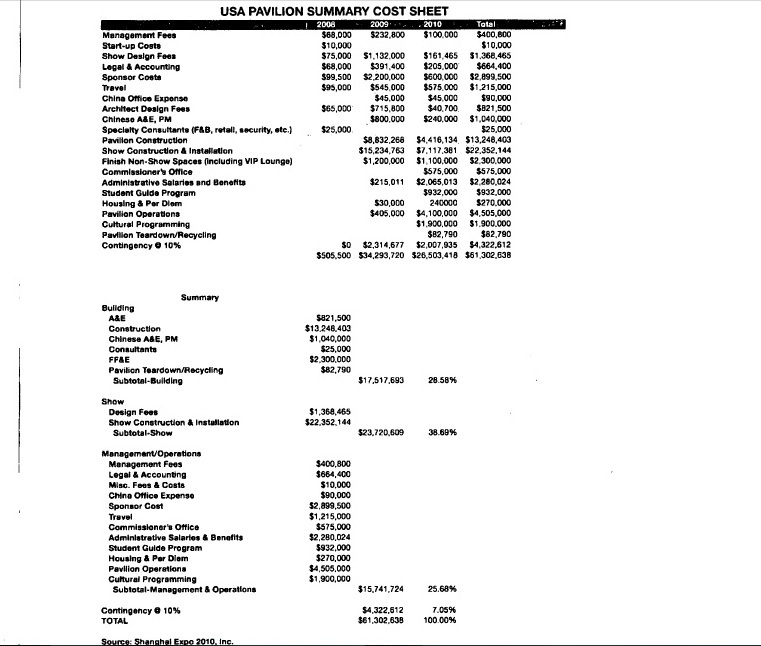 And lo and behold, there, amidst a very interesting filing that I’ll touch upon in coming days, we find a June 29, 2009 document helpfully named “USA Pavilion Summary Cost Sheet.” Click the thumbnail document below to expand it. It’s important to keep in mind that the numbers in this document were made a few weeks before the pavilion ground-breaking, and so they may have changed in the intervening months (then again, many of the numbers conform to what I and others have heard around town). Still, in the interest of accuracy and fairness, yesterday I forwarded a copy of the Cost Sheet to Martin Alintuck, spokesman for the USA pavilion, offering Shanghai Expo 2010, Inc the opportunity to comment upon, update, or correct any of the figures. Alintuck has not responded. Meanwhile, over the weekend I shared the Cost Sheet with two individuals associated in similar ways with Expo 2010, and they were kind enough to provide me with their thoughts on it. I’ve also shared it with someone familiar with Shanghai construction costs, and collated the three responses, placing a handful of the most interesting ones next to the associated costs. Note that the three individuals assumed anonymity when commenting. Teardown/Recycling – $82,790. Speaking as the author of Shanghai Scrap, and based on a near decade covering the Chinese recycling trade, this number is preposterous. The total cost to dismantle and recycle the USA pavilion should be zero. In fact, if the situation is managed correctly, demolition/recycling companies will bid for the demolition rights. Demolition/recycling isn’t a cost; it’s a cash input. I’m going to open up comments for this one, in hope that folks with experience in non-profit management, exhibit design and production, and/or Chinese building construction might lend some insight into whether or not these expenses make sense. Please keep it civil. This entry was posted in Expo 2010 - US Pavilion and tagged Canadian architect, Clive Grout, Expo 2010, us pavilion, USA pavilion, USA pavilion cost, World Expo by Adam. Bookmark the permalink. I had an interesting run-in with the Expo myself, in the “Culture” department, in which I was asked to provide cultural programming for free… as an proud American, I felt honored to offer my service, until my experience with this group showed me that they had no cultural sensitivity, no understanding of the language, were only concerned about lording their status over the local expat population, were completely inaccessible to questions, and unaccountable for their “processing” of materials I gave to them. After I saw how much money was being burnt by this group, in contrast to all that others were asked to “contribute”, I withdrew my offer to volunteer. I am ashamed of their behavior and have turned down requests from Chinese media to do positive reporting on the US Pavilion as a result. They are clearly uninterested in serving their country, but have seized the opportunity to make a large amount of money in short amount of time while pretending to spread America’s influence. This is not the kind of reputation that Americans need in China, and will only further the growing rift that those of us who live and work in China feel between the values we claim and what our actions demonstrate to the Chinese. no surprise .. cost out the “wars” that have been going on for the last 7 years, procurement in any arena, expense accounts on wall street or in the oil industry ..
the papers just have to look correct, no one cares about the numbers .. I think the Pentagon would even struggle to put up numbers like that without blushing. Oh, I am not at all surprised with this figures. People can work “magic” about this stuff. Shameful. With that kind of money being thrown around you really have to wonder if somebody is pocketing money intended for the pavilion. If I were a donor I’d want to know. Its extremely difficult to critique the costs associated with the many functions that comprise the development, design and construction of a major exposition pavilion after the fact. 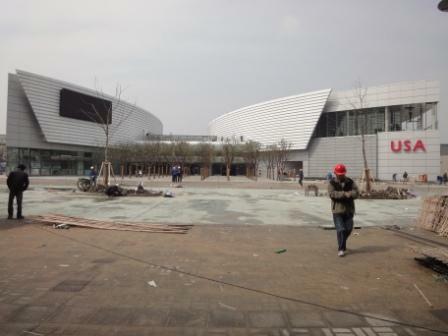 The issue for me is not the appropriateness or validity of the hard and soft costs identified in the summary, its the fact that the organizers of Shanghai Pavilion 2010 were entrusted with the project despite their complete lack of experience with World’s Fair participation and the fact that they did not participate in the RFP process initiated by the State Department in November of 2006, were not required to compete for the project with trained professionals and clearly stepped into a vacuum created by an inept federal agency. The organizers were not driven by a burning desire to reestablish the richness of content, aesthetics, imagination and innovation associated with once powerful United States Pavilions created by individuals and organizations drawn from the enormously talented community of architects and designers who have in the past competed openly for the commission and risen to the task of showcasing America’s technological and social empathy for every aspect of the Exposition theme. They simply profited from inside information about the lack of federal leadership, optimized their political connections and seized the opportunity to make off with the project. I don’t know what Barry is talking about but I do know that paying 800k for a design that looks like a used car dealership is way too much. I have been researching similar opaque operations of the Mexican Pavilion in Expos 2005 Aichi, 2008 Zaragoza and 2010 Shanghai. It seems that the USA government has been learning from its Mexican counterpart. But still, I think that the problem of lack of transparency is way bigger in the USA than Mexico. 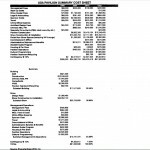 It’s not a question of total cost…it is more a question of how this compares to other pavillions…any idea how it stacks up? I visited the USA pavilion yesterday and saw the movies. I am no expert on movie making so you can take what I say with a grain of salt, but I am really shocked to read those cost $23 million dollars. They look like the corporate promotion videos that my company used to sell in Bloomington Indiana. The last movie was just weird. No words and the seats shook at the end. There was some rain and wind too. I agree with the above people who say that the money doesn’t matter so much. What matters more is that the movies are total crap and make America look like a joke. From what I’ve heard and seen of this pavilion, I can tell you that someone is pocketing a huge profit from the show design. There is no way that the production costs of three theatre shows could exceed the physical building costs, especially when they are not movie grade productions. I speak of this from experience of personally having worked on several expo pavilions. Keep fighting the good fight, this is interesting. Good to know this wasn’t tax payer money but corporate sponsorship money. Shouldn’t the sponsors be raising holy hell about this? Adam, do you know if the non-profit is subject to an audit of some kind? Either by State or someone else? It would seem warranted even with the corporate money. Adam, the most important point to make out of all this is that it is May 4, four days after the grand opening of the Expo. Any questions surrounding construction costs or how the pavilion came together — an American pavilion built by corporate money, not government support — are moot points. The Expo has started. Move on. standback and others: if the usa pavilion is operating as a non-profit 501c3 it might very well be in violation of the law for spending money in such a manner as to be outside of its core mission. There’d need to be an audit of some kind but based upon the comments here I think there’s probably grounds to look into it. Good work Adam in getting the tax documents. I’m afraid however that unless there’s some kind of smoking gun contained in whatever you obtained that the rest of this investigation might be in the hands of the IRS (assuming that they care). The costs are much too high and totally unjustifiable. Any halfway decent auditor would know that the next step is to audit whoever gave BRC a $23 million contract for something that could be done profitably for less than half of that. Who at the non-profit gave the money and who at State was in charge of supervising them? That’s who should be audited. Villarreal can’t audit anybody but he is in a position to get the IRS to look into it. His complaint would be taken seriously. Then again Villarreal has been around for a year and presumably he knew that $23 million was being spent on the programming. He didn’t do anything but raise money for it. US public dipomacy shouldn’t be an opportunity for people line their pockets in the name of the US government. This is a terrible shame on the US. The only people who seem happy about it are the ones who have careers or pocketbooks that might benefit from it. “2010 World Expo Strengthens U.S.-China Ties Partnerships build anticipation for USA Pavilion in Shanghai,” in the State Department’s PR organ, America.gov. Clinton praises the Chinese government and multinational corporations, but says nothing about average Americans or Chinese. She is above us. The US Pavilion is clearly symptomatic of a much bigger problem, the sell-off of the US Government. Our embassies might be next: they’d make great fortresses for hedge funds. Zach: The Expo is an ongoing process. May 1st was just one milestone of many. Also, Cesar Corona’s blog, linked above, is another fascinating investigation into Expo decadence, a great piece of work. Very symptomatic of the common culture of multinational non-profit work, in my non-expert opinion.